This page contains Global IT Communications, Inc. (the "company", "us", "we", or "our") Web Development Terms of Service. Global IT expects its clients (the “customer,” “user,” “you,” or “your”) to carefully read and understand this document. By doing business with Global IT, you are subject to the following terms and conditions. Global IT reserves the right to modify these terms at any time, or against any customer it believes is abusing this agreement. Any such revision or change will be binding and effective immediately after posting of the revised Terms of Service on our website. You agree to periodically review our Terms of Service, including the current version of our Terms of Service. Our Web Development Terms of Service agreement is made available at: http://internett1.com/wdtos. It is your obligation to review our Terms of Service for any such revisions. Quotes and promotional rates provided to prospects will be honored for up to 15 days. A new quote will then be provided upon request. Terms of Reference (TR) that have been written, but not signed by the client will only be accepted within 30 days of the delivery date. A new contract may be drawn up upon request. All new web design projects that are $1,000 USD or less require full payment upon initial purchase. Projects where the total cost is over $1,000 USD will be split into 2 payments. An initial 75% deposit will be due immediately before we begin work on the website. The remaining 25% balance will be due upon acceptance of the completed web design project before it is released to the client or published on the Internet. Clients outside the United States are required to pay in full for their web design project. This is non-negotiable. For websites under $3,000 USD the web development process used by Global IT is divided into 2 stages. Once all the information is collected from the client, such as general structure, color scheme, content, use of logo and images most of the creative decisions pertaining to the website will be determined by the Global IT web designer. The client is then provided with one round of edits. We generally prefer to receive this list via email although we may communicate with the client by phone as well if we need clarification before moving forward. Should the client want Global IT to provide mock ups of the website there is an additional fee for each mock up. Once the requested edits are made and Global IT receives the final payment, Global IT will publish the live website. For websites over $3,000 USD the web development process used by Global IT is divided into 3 stages. In the first stage, Global IT collects all the needed information from the client and creates a contract called the Terms of Reference (TR). Once the TR is signed off by both parties the initial development of the website begins. The projected amount of time originally quoted to the client will start once the TR is complete. From this point forward if the client wants to add or change anything signed off on the TR, the project will be subject to additional fees. In the second stage, Global IT will release a mock up for each of the web pages that require a different layout. The client is then provided with one round of edits. We generally prefer to receive this list via email although we may communicate with the client by phone as well if we need clarification before moving forward. Once the edits have been made to the mock up and all parties agree with the design the project moves forward with the third and final stage. If the client wants to add or change any of the design work once the edits have been made the project will be subject to additional fees. Sometimes Global IT may provide a prototype of the website if they feel it is necessary. The prototype will show the functionality of the website without the design elements integrated into it. Not all websites will require a prototype. In the final stage, Global IT will implement the design elements into the proposed format. The client will be provided with a link to the fully functional test site. The client is then provided with one round of edits which must be supplied to us within 30 days, otherwise Global IT will accept this non-communication and acceptance of project. Again, we prefer to receive this list via email although we may communicate with the client by phone as well if we need clarification before moving forward. Once the edits have been made to the test site and the client has made the final payment, Global IT will release the live website. If the client wants to make changes to the website after these final rounds of edits have been made, the project will be subject to additional fees. In order to host the client's website upon its publication, it may be necessary to perform what is known as a DNS (Domain Name Server) change to the client's domain name. This change will make it possible for visitors to view the new website whenever they visit the domain name owned by the client. We will provide the necessary DNS and IP modifications to a single domain name owned by the client as long as the changes don't exceed one hour (1 hr) of our developer's time. In order to perform the DNS change, we request that the client sends us a username and password to the control panel used to manage the domain name. If this is not possible, we may be able to contact the registrar (domain registration company) on behalf of the client and work with them to perform the necessary modifications. We reserve the right to charge the client by the hour to assist in transferring their domain name or perform the DNS modifications if we believe the amount of time needed to perform the changes could be excessive. 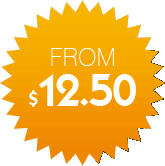 The hourly rate applied will be the same as our standard design rate of $75.00 USD. The client is expected to provide Global IT with a list of pages he/she wishes to build for the website. In addition, we assume that any content to be built will be presented within the first week of initial web design purchase or before the TR is complete. Requests for new pages or additional content after the completion of the TR will not be accepted. We reserve the right to bill the client separately for any requests that are not declared upon completion of the TR. If the client requires additional content to be written for the website, additional fees for this service start at $150 per page, depending on the type of content needed or an hourly rate of $75.00 per hour for html and image work; $125 per hour for specific programming. All Global IT custom web design clients will have "Powered by Global IT" link on their website in the footer of every page. This is non-negotiable. By hiring us to work on your website you are agreeing to this, and that you understand that this link may NOT be removed without our consent. At our sole discretion, we may agree to accept a fee of $250 USD to allow this link to be permanently removed. Should you have a new layout designed for your site by a company other than Global IT, you may remove the credit from your website. Upon completion of the project, Global IT transfers all rights and ownership of custom designs and programming written by Global IT to the client. Software and third party graphics or programs are not transferred to the client and remain under copyright of their respective owners. Global IT reserves the right to resell custom designed web sites that remain unpaid by the original client, unaccepted mockups or other graphics created by our company but not in legal use by the client. Global IT reserves the right to display websites and graphics that have been designed by our company, and in any marketing material to aid as examples of our work. Global IT understands the importance of completing projects in a timely manner. If the client does not supply Global IT with complete text, graphic content and other requested materials for the website within 30 days of initial web design purchase, the work order becomes void and all deposits and other payments paid by the client are forfeited. The client may request a Project Extension in writing to Global IT for an additional fee. All extension fees are due upon agreement of the extension between Global IT and the client. If the TR and/or the mock ups have been completed by Global IT and the client takes longer than 45 days to approve the work, the project will be canceled without prior notice and no refund will be issued. Unless the client is hosting his website with Global IT, we will consider our work on the website finished once it has been published or approved by the client. Additional development or assistance after the website is deemed "complete" will be billed by the hour. The hourly rate will be determined at the time of the request and may differ from the initial web development purchase price. If the client is hosting his website with Global IT, limited support will be provided on a monthly basis according to our Hosting Terms of Service. Clients may review the Managed Hosting Terms of Service at: http://internett1.com/termsandconditions. If we are unable to communicate with a client on a project for a duration of at least 45 days by phone or email during the design and development process, the project will be canceled without prior notice and no refund will be issued. Global IT cannot be held liable for the failure to complete a project within a pre-determined time frame or by a specified deadline. We cannot be held liable for any predicted estimate of profits in which a client would have gained if their site was functioning or had been published (made publicly available online) by a certain date. Project due dates provided to the client by Global IT, are estimates based on the number of currently open projects. We cannot guarantee that a project will be finished by a specified date. All due dates and deadlines are not final and may be revised if needed. Projects may fall behind schedule due to circumstances beyond our control, such as an unexpected increase in the workload provided to us by other clients. Projects may also be delayed if they require more design time than initially anticipated by our web designer or project manager. You agree to protect, defend, indemnify and hold us harmless from and against any and all claims, causes of action, liabilities, judgments, penalties, losses, costs, damages and expenses (including attorneys' fees and all related costs and expenses of litigation at arbitration, or at trial or on appeal, if any, whether or not litigation or arbitration is instituted) suffered or incurred by us, including, without limitation, any claim for personal injury, property damage, or loss of profit arising from: (i) these Terms; (ii) the Services provided to you by us; (iii) your use of the Services including without limitation any copyright infringement claims that could arise from storing your website files on our web server; (iv) the failure of our company to provide any services on time or as expected; (v) loss, damage, or destruction of your website or email messages by any cause whatsoever whether or not attributable to our negligence or intentional act; (vi) any violation by you of any federal, state or local laws, statutes, rules or regulations; and (vii) for the consequences of any attempts of third parties to serve you with legal process through the Services or our facility. For purposes of these Terms, the indemnified parties shall include Global IT and its owners, affiliates, subsidiaries, members, successors, assigns, representatives, officers, directors, agents, attorneys and employees. Global IT reserves the right to decline to do business with any client, at any time, and for any reason. We reserve the right to discontinue the design of your website and terminate our mutual business relationship at any stage in the design process and for any of the following reasons: (1) We believe your behavior or communication towards our staff (employees, owners and affiliates) or other customers is offensive, abusive, violent, threatening or disruptive in any way. (2) Our employees, representatives, support staff and or other members of Global IT believe they are unable to communicate with you effectively. This may be due to an inability to reach you over a prolonged period of time or in the case that we are not able to come to an agreement about certain aspects of the design of your website. If we decide to discontinue the design of your website, you will be provided with a partial refund, calculated based on the time we spent working on your website and communicating with you in regards to the project. The amount of the refund provided will be decided at our sole discretion. If the client wishes to terminate the web design services, we require a written request. If the client has not yet agreed to the Terms of Service, a partial refund will be provided calculated based on the time we spent working on your website and communicating with you in regards to the project. The amount of the refund provided will be decided at our sole discretion. If the client has agreed to the Terms of Service and we have proceeded with the development of the website, no refund will be issued. Payments for custom design projects are made to us in increments as a courtesy to the client. Once a payment or deposit is made, it is non-refundable and used for planning, preparation for the upcoming project. If a project is canceled or postponed, all monies paid are retained by Global IT and if applicable, a fee for all work completed beyond what was already paid for shall be paid by the client. Third party vendors may have separate terms of service agreements. Global IT cannot be held liable for disputes with third party vendors. Global IT cannot be held responsible for lack of functionality or any other aspect of third party services. Please note that by submitting your down payment for our design service you are agreeing to all of our terms of service as written here. Global IT reserves the right to change or update these terms at any time without prior notice. This agreement shall be governed by and construed in accordance with the laws of the state of California. If any provision of this agreement shall be unlawful, void, or for any reason unenforceable, then that provision shall be deemed severable from this agreement and shall not affect the validity and enforceability of any remaining provisions. Revised and effective: February 8th, 2012.